Need more motivation to walk? Many cruises also sponsor a charity walk one day during the week. For a donation, you usually get a t-shirt and then all the participants head up to the track for a walkathon. Six cancer organizations that are supported by Holland America Line’s “On Deck for a Cause”, a 5k fundraising walk on each sailing. How can you resist doing your part? Pass by the elevators and take the stairs. They’re usually wide enough so don’t have to worry about holding up people behind you if you’re a bit slow and there’s always hand rails. I’m not suggesting you climb from the dining room on deck 2 up to your room on deck 12 multiple times a day but a deck or two or three throughout the day add up! 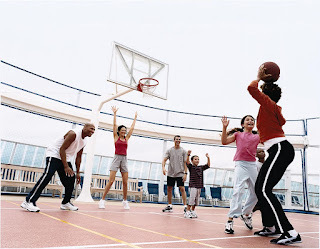 Cruise ship fitness centers are probably better equipped than most in your home town! I’m talking state-of-the-art gyms with your favorite workout equipment such as treadmills, ellipticals, steppers, stationary bikes, medicine & fit balls, and free weights. What I love best is when the cardio machines are in front of a huge floor to ceiling window. I’ll go an extra few miles just to enjoy the view! Sign up for a fitness classes. Some classes are free while others charge a fee, but there’s so many offered. Try outdoor yoga, Pilates, Zumba, TRX or body boot camp to name a few. My personal favorite is spinning, especially the Fly Wheel Studios on select Royal Caribbean and Norwegian Cruise Line Ships. Take advantage of one of the many adventurous onboard activities that are so popular on today’s ships. There’s rock climbing walls, ice skating, roller skating, sports courts, ropes courses, surf simulators, sky riding and more! Swim. 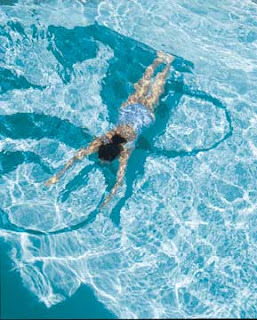 Okay, I admit, you need to get to the pool early in the morning to have enough room to swim laps but it can be done! Swim before breakfast and then you won’t feel guilty if you have bacon and hash browns with your syrup drenched pancakes! Choose to be active in every port of call. Try a more energetic shore excursion like kayaking, rowing, biking, or hiking. I always opt for walking tours, particularly when I’m on a European cruise. 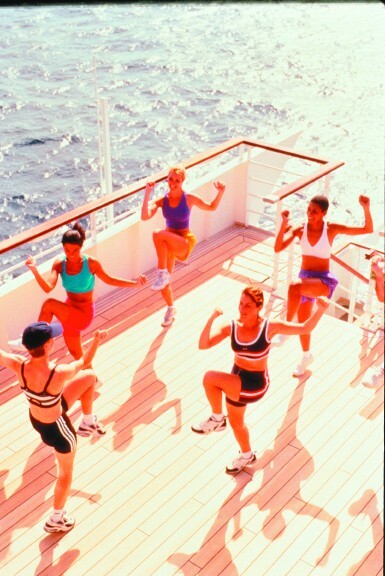 Learn a couple of new dance steps…most cruise lines give classes. Maybe cha-cha-cha, merengue, salsa, or the hustle! Then dance the night away!